Relay FM (Free) byRelay FM, LLC is an app designed to help you keep up-to-date with your favorite shows on theRelay.FM podcast network. If you’re looking for a podcast network that is full of great shows that cover a wide range of topics, then this app is definitely worth checking out. I’ve been listening to podcasts for years now, with my first being MacBreak Weekly shortly after I got my first iPhone back in 2008. While I love listening to music when I need to focus on work and projects, I prefer podcasts in the background whenever I have some time to kill. I’ve learned a lot of useful tips, tricks, and new things from podcasts, and over the years, one of my favorite new networks has been Relay, mostly due to the great choices of hosts. I’ve been anticipating this app for a while now, and I’ve been giving it a try since it came out last week. The best thing about the app is the fact that it doesn’t want to replace your current podcast app of choice, but rather just supplement it. The design of the Relay FM app is beautiful, which is just as I’d expect from the team. It’s organized into three sections: Latest, Notifications, and Support Us. Most of the time spent in the app will be on the Latest view, which is what it opens to by default. Here, you get a gorgeous list of each show on the network that has had a new episode, with the most recent at the top of the list. Each episode shows off the podcast artwork in a large, thick bar, and you can see the name and slogan for each show underneath as well, or expand to get show notes. The buttons for playback, getting notifications for live episodes, and subscribing are all large and easy to spot, making the overall user experience rather friendly. For a special treat, watch the show artwork when you play an episode and have the “Motion effects” setting on. Personally, I will always prefer to use my podcast app (Overcast) to listen to episodes, but the Relay FM app serves the same purpose for when you want to get caught up with the latest episode. 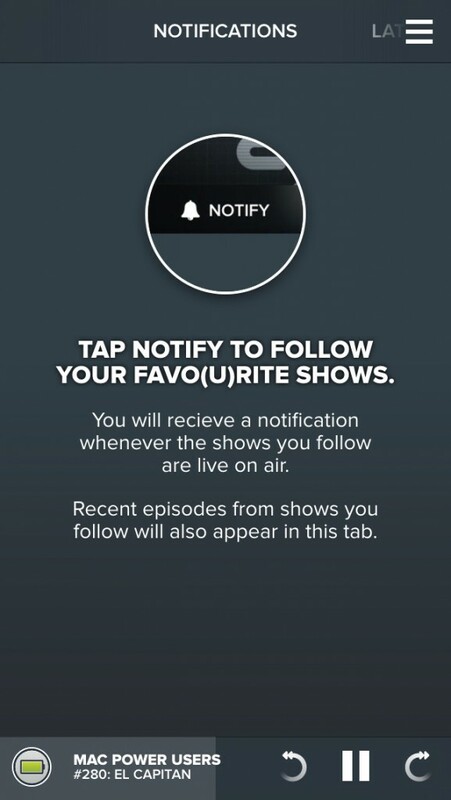 Or, if you enable notifications for your favorite shows, you not only get notified when the show goes live on the air, but you’ll be able to listen to past episodes of that particular show too. When you are playing an episode from the Relay FM app, a mini-player takes residence at the bottom of the screen, giving users options for play/pause, rewind, and skipping forward. Audio plays in the background, and you can control it directly from your Apple Watch as well. By default, the Relay FM app is set to the standard 1x playback speed. If that is not to your own liking, you can tap on the hamburger button in the top right corner to access the settings. From here, you can change the text display size, playback speed (from 0.05 to 2X), toggle updates over cellular, and enable or disable motion effects. 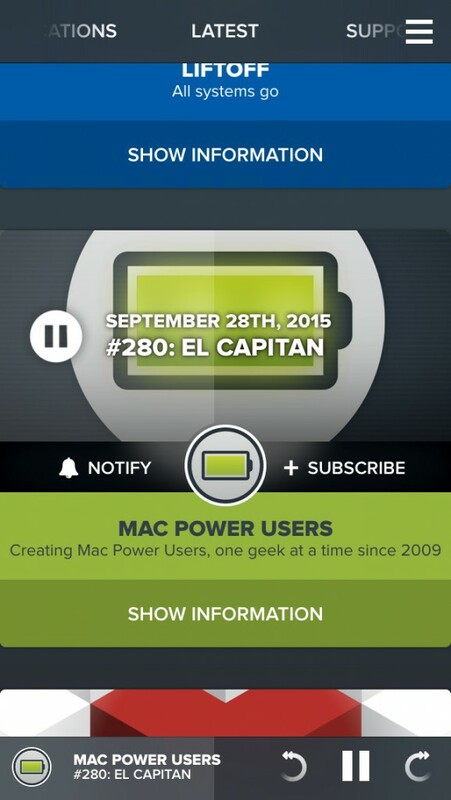 I mentioned earlier how this app is designed to supplement your existing podcast app. That’s because when you tap on the “Subscribe” button, a custom-designed share sheet pops up with options for launching several different apps and subscribing through those, rather than the Relay FM app. The options included are Overcast, Pocket Casts, Castro, Downcast, and Apple’s Podcasts. You can also copy the RSS URL to the clipboard or use the native iOS Share Sheet and choose the app of your choice from there. I’ve been a big fan of the Relay FM network since it launched a little over a year ago, and it is one of my biggest sources of entertainment when I have some time to spare. The app the team has put out is pretty awesome, though I did feel the scrolling can be a bit jerky on my iPhone 6s Plus sometimes, so hopefully it gets smoothed out in a future update. While I love the fact that this app will make it much more easy to catch my favorite shows live, I do wish that there was a way to get into the chat room, but I can only imagine that is a feature coming in the future. If you’re a fan of the Relay FM network or just want to indulge in some new, informative podcasts, I recommend checking out the Relay FM app for yourself.Relay FM is available on the App Store as a universal download for free. Last updated by horkykwok at 2015-12-14 .